Bangkok Motor Show 2018 again comes with a myriad of new variants in the line of four wheels and two wheels. One of the highlights is the new Mitsubishi concept that looks like Xpander. The car is called eX Concept. His presence on the exhibition stage is not just this once, but in 2015 and then exactly at the Tokyo Motor Show, this car has been introduced to the public. 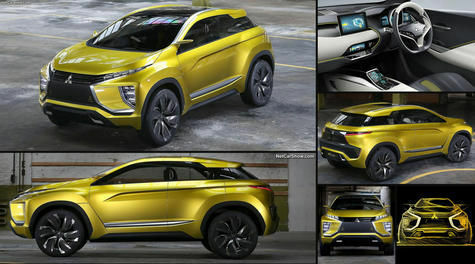 The engine is different from the existing Mitsubishi Xpander in Indonesia because, eX Concept has an electric motor that is environmentally friendly. Reportedly, the presence of eX Concept is a strategic step of the Japanese manufacturer to face the trend of future electric vehicles. "Drive Your Ambition is our latest global brand strategy. The logical development of the essence of the brand and describes the attitude since Mitsubishi's first car was born more than 100 years ago, "said Morikazu Chokki, President and CEO of Mitsubishi Motors (Thailand) Co., Ltd.
Mitsubishi has been preparing the latest technology that can make this car to explore long distances, although only rely on electrical energy. These technologies include Twin Motor 4WD and S-AWC (Super All Wheel Control) drive system. According to claims Mitsubishi, the device makes eX Concept able to travel 400 km distance in full battery condition.